The idea that Russian security services hacked the Democratic National Committee's emails and released them to Wikileaks in order to cause the election of Donald Trump has bounced off the walls of the beltway's echo chamber so many times it is as deafening as one would imagine the four trumpets in the book of revelations to be. For those who have followed the leaks, and read the emails, and have some actual knowledge of information security, the words of politicians are not divine and the beltway press might be a choir, but not of angels. The Director of National Intelligence and former head of the NSA General Clapper joined FBI Director James Comey in claiming they had classified confirmation that Russian intelligence was behind the leaks. This claim began as the leaks began to embarrassed the Clinton Campaign during the lead up to the Democratic National Convention. The revelations proved the widely held suspicion that the Democratic National Committee had picked Clinton prior the announcement of her candidacy and had systematically undermined the Sanders campaign. Clapper should have been briefed if a presidential campaign was attacked by foreign intelligence services. Clinton's private email server, alleged to have had classified materials on it, was also compromised during the spate of attacks. Yet the Director of National Intelligence said nothing when potentially classified materials fell into the hands of foreign intelligence. The FBI, which was investigating the very content that was stolen from some of those servers, also said nothing. The FBI also can not hack an I-Phone without help from Israel, while I figured out how without having ever owned an I-Phone. Surely the FBI has somebody better than me working for them. Therefore Director Comey has a history of lying about cyber security capabilities and issues. As reported years ago, Clapper has admitted to lying during a Congressional hearing, claiming he gave the least untruthful answer. That is a very interesting way to mislead the public about the fact that you lied to Congress. Spies lie. Spies are paid to lie. By definition lying is part of the job description of being a spy. The chief spy of a nation should be one of it's best liars if that nation is to succeed. The first source of the claims that Russian intelligence was behind the email hacks were two private companies hired by the Clinton Campaign prior to the release of the emails on wikileaks. No state security agency was brought into the investigation until after the claims were made by the Clinton Campaign. The hired security companies, Crowdstrike and Fireeye, both have historical financial ties to the CIA. As Tea Leaves was reporting his incomplete readings, the Russian bank also hired a cybersecurity firm, Mandiant, to investigate their own dealings with Trump's misconfigured secret server. Their findings as reported by Slate were “Mandiant is still doing its deep dive into the Alfa Bank systems. Its leading theory is that Alfa Bank's servers may have been responding with common DNS look ups to spam sent to it by a marketing server. But it doesn't want to speak on the record until it's finished its investigation.” In other words, Mandiant found nothing to connect Russia to Trump when given unfettered access to the servers by the bank itself. 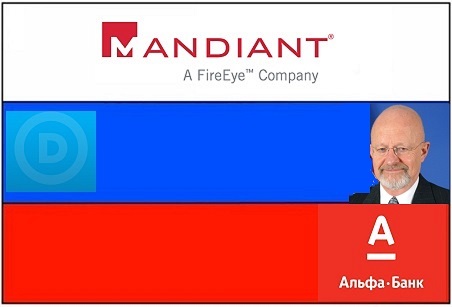 What Slate failed to notice, which they could have by having a single clue about the cyber security industry, is that Mandiant is a subsidiary of Fireeye, who was claiming Russian hackers were putting their thumbs on the scale at for Trump at the very same time. Fireeye had access to servers on both sides of the equation, and told one client one thing and another client another thing. Only one of the things they told one of their clients could be true. Taken together, you have campaign season claims made by a very embarrassed Clinton entourage, sourced to a CIA front company, and belated lies from the worst two liars in the entire intelligence community forming the basis of a National Discourse. The beltway echo chamber could not sound less like angels and more like nails on a chalk board if it tried.